Otto Penzler, New York Sun: "A hugely important book. It belongs on the shelf of every detective fiction reader and collector. It is a book to be read with pleasure." Michael Rogers, Library Journal: (Starred review) "Lost might be an overstatement, but these 21 Hammett mysteries are tough to find elsewhere, and it's great having them together. The stories, which run the breadth of the author's career—from the 1920s through the 1940s—are buttressed by a swell introduction by fellow mystery writer and Hammett aficionado Joe Gores. Hammett's Lost Stories is must reading for mystery buffs." Dashiell Hammett, the bestselling creator of Sam Spade, The Maltese Falcon, and The Thin Man, was one of the America's most entertaining authors, and one of its most influential. Even so, many of Hammett's stories—including some of his best—have been out of the reach of anyone but a handful of scholars and collectors—until now. Lost Stories rescues 21 long-lost Hammett stories, all either never published in an anthology or unavailable for decades. You cannot find these stories anywhere else. Readers of Hammett's famous mysteries will be surprised by the variety of the stories here. They include Hammett's first detective fiction, humorous satires, adventure yarns, a sensitive autobiographical piece, a Thin Man story told with photos, and a tale that Ellery Queen promises "is one of the most startling stories you have ever read." For each story, Hammett researcher Vince Emery tells how Hammett's life shaped the story and how the story affected his life. Emery's comments reveal surprises about Hammett's life not covered in any other book. Stories range from the first fiction Hammett ever wrote to his last. All stories have been restored to their original versions, replacing often-wholesale cuts with Hammett's original text for the first time. To round out this celebration of Hammett, three-time Edgar Award winner Joe Gores has written an introduction describing how Hammett influenced literature, movies, television, and Gores' own life. Part Five: 1925, Establish Writer Quits? Click here for reviews of this book. Click here for some questions this book answers. Click here for news about this book. 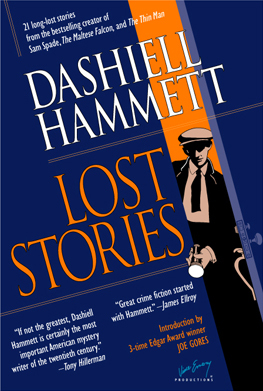 Lost Stories is the first title in The Ace Performer Collection, a series of books by and about Dashiell Hammett, crowned "the ace performer" by his disciple Raymond Chandler. 8 illustrations, 38 photographs; 352 pages. Edited by Vince Emery. Trade hardcover edition publication date September 1, 2005, $24.95, ISBN 0-9725898-1-3. Order Lost Stories from your local mystery bookstore, your local independent bookstore, and all major bookstores and online booksellers. Publication of the trade hardcover edition was preceded by a deluxe limited edition. Click here for information about the deluxe limited edition. Boring legal stuff: Copyright 2004-2009 Vince Emery Productions. "Vince Emery" is a registered trademark of Vince Emery Productions. "Vince Emery Productions," "emerybooks.com," and the Vince Emery signature are trademarks of Vince Emery Productions. So there.